Fifteen years ago, Esther was determined to give her new son his own birthday. She made the extra effort to give birth to a 10 lb. baby boy at 11:45 PM, fifteen minutes before her birthday! Once again, birth weight proves to be prophetic as Calvin is the biggest of our three sons. This fall, he begins the 9th grade and is taller than his older brothers. 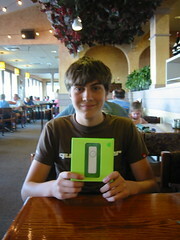 To celebratre his birthday, we went to Tacoma where he chose an iPod Shuffle for his gift. Now all four of the Bulthuis men have an iPod! We went to Olive Garden for dinner on an unusually warm evening.